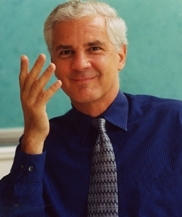 Joseph Cirincione. [Source: Takoma / Silver Spring Voice]Joseph Cirincione, an expert on proliferation issues and national security, is detailed by Congress to find out just how well the Patriot missile performed in combat during the Gulf War. George H.W. Bush told a group of Raytheon employees, who helped manufacture the Patriot missile system, that the system had performed admirably during the war: “Forty-two [Iraqi] SCUD [missiles] engaged, 41 intercepted.” (Some sources later cite Bush as claiming that the figures were 43 of 45.) Television viewers around the globe were familiar with video footage of Patriot batteries blazing away at the sky during the middle of the night; such images became icons of the technological success of the war. However, Cirincione finds a very different story for the Patriot. 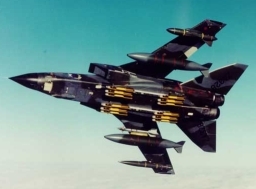 His investigations of Defense Department records shows that the Patriot actually only brought down two to four SCUDs in 44 intercept attempts, or about a 10 percent success rate. The video footage rerun so often by American news broadcasters was of Patriots exploding in midflight. Nevertheless, Congressional funding for the Patriot and other missile defense systems rose dramatically after the war. 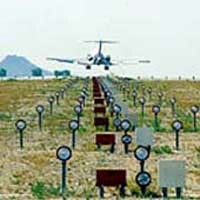 After a successful test, the FAA makes an enhancement to the Global Positioning System (GPS) called Wide Area Augmentation System (WAAS) available to some aviation users. WAAS improves the accuracy of GPS data by correcting some known measuring errors. “The system demonstrated one to two meters horizontal accuracy and two to three meters vertical accuracy throughout the contiguous United States,” says the FAA. The system will be operated by Raytheon. [Federal Aviation Administration, 8/24/2000] The deployment of WAAS is only one of many technological advances that could lead to pilotless aircraft navigation, including takeoff and landing. Tests have shown that landing by autopilot is possible (see also August 25, 2001). [Spinoff, 1998; Federal Aviation Administration, 8/13/1999; Rockwell Collins, 10/5/1999] WAAS also has non-aviation uses. It will be used during the rescue effort at Ground Zero. “[A]t the World Trade Center, rescue teams used WAAS to survey the site during the recovery program,” according to Avionics Magazine. [Avionics Magazine, 2/1/2002] After 9/11 there will be some speculation that the hijackers used GPS to navigate to their targets (see (September 12-17, 2001)). Some press reports will claim that 9/11 hijacker Mohamed Atta was at the WTC the day before the attacks to gather GPS data (see September 10, 2001). Barry McCaffrey. [Source: NBC]The Nation examines the use of so-called “military analysts” by the broadcast news media, retired generals and high-ranking officers brought on camera to share their knowledge and expertise regarding the invasion of Iraq. The report finds that, like Defense Secretary Donald Rumsfeld and many other administration officials and supporters, the retired military analysts have consistently taken a pro-military, pro-administration slant that has led many of them to make consistently wrong judgments and analyzes. It will be five years before the New York Times exposes the Pentagon propaganda operation in which many of these analysts take part (see April 20, 2008 and Early 2002 and Beyond). Ideological and Financial Interests in Promoting the War - While many of them indeed have what one analyst, retired Lieutenant General Barry McCaffrey, calls “a lifetime of experience and objectivity,” many of them also have what the report terms as “ideological or financial stakes in the war. Many hold paid advisory board and executive positions at defense companies and serve as advisers for groups that promoted an invasion of Iraq.” As a result, the report says, these analysts’ objectivity must be questioned. McCaffrey and his colleague, retired Colonel Wayne Downing, both NBC analysts, are both on the advisory board of the Committee for the Liberation of Iraq, a lobbying group formed to bolster public support for the invasion. Its mission is to “engage in educational advocacy efforts to mobilize US and international support for policies aimed at ending the aggression of Saddam Hussein,” and it deliberately reaches out to influence reporting in both the US and European media. Downing has also served as an unpaid adviser to Ahmed Chalabi’s Iraqi National Congress, a prime source of the fraudulent propaganda and disinformation that provided a rationale for the war (see June 1992 and (1994)). NBC viewers are unaware of McCaffrey’s and Downing’s connections to these pro-war organizations. McCaffrey and IDT - Neither are they aware of McCaffrey’s seat on the board of four defense firms—Mitretek, Veritas Capital, Raytheon Aerospace, and Integrated Defense Technologies (IDT)—all which have multimillion-dollar defense contracts. IDT is of particular interest, as stock analysts believe that its currently floundering financial state could be remedied by hefty government contracts. 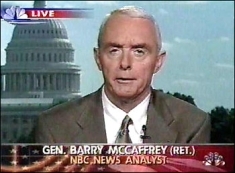 McCaffrey has been an outspoken critic of Rumsfeld and his war policies, but his primary objection is his repeated statement that “armor and artillery don’t count” enough in the offensive. He recently told an MSNBC audience, “Thank God for the Abrams tank and… the Bradley fighting vehicle,” and added that the “war isn’t over until we’ve got a tank sitting on top of Saddam’s bunker.” In March 2003, IDT received over $14 million in contracts relating to Abrams and Bradley machinery parts and support hardware. Downing and Metal Storm - Downing is a board member of Metal Storm Ltd, a ballistics-technology company with both US and Australian defense contracts. According to its executive director, Metal Storm’s technologies will “provide some significant advantage” in the type of urban warfare being fought in Iraq. Fox News and wvc3 - Fox News analysts Lieutenant Colonel William Cowan and Major Robert Bevelacqua are CEO and vice president, respectively, of the wvc3group, a defense consulting firm that serves as a liaison between arms companies and the US government. The firm recently signed a contract to promote military aviation equipment produced by a New Zealand firm. The firm promotes itself by advising potential customers of its inside contacts with the US military and the Defense Department. A message on its Web site, augmented by a sound file of loud gunfire, reads, “We use our credibility to promote your technology.” Another Fox analyst, Major General Paul Vallely, represents several information-technology firms. Vallely is most valuable, says Fox bureau chief Kim Hume, as a commentator on psychological operations.